Parenting doesn’t come with a handbook and sometimes we question ourselves on how well we are parenting. Are we guiding our children the proper way? Does my child look up to me? Many of us can get distracted fueling our goals and dreams, neglecting our children’s dreams. As a parent, it’s our responsibility to support our children and help them achieve their desires. Before you know it, our little seeds will be in middle school, high school or early adult years. They have their whole life ahead of them and they are ready to discover their purpose in life. 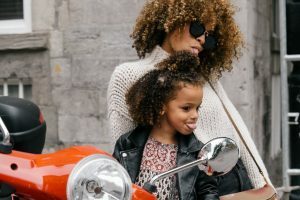 How do I assist my child in discovering their purpose? As millennials, it’s easy to get caught up in our own vision and goals, forcing our children to achieve a dream that may not be their own. As they grow up, we take pride in the ways they resemble us but understand that their interest may be different than yours. We are all wired differently, which means we are motivated and inspired differently. When you ask your child, “How was your day”, do you take the time to look them in their eyes? Do you hold their hand and just listen? I recognize my daughter is becoming older, she just turned 10 and loves to talk my head off. Yes, I’m occasionally annoyed by pre-teen bantering, but the older they get it’s essential that they know you are listening. Open-ended questions require detailed answers. Questions that don’t allow predictable answers unlock your child’s intellect. Q & A’s lead to amazing ideas, that stimulate young minds and allow both you and your child to grow mentally. The outcome of the exercise can reveal your child’s brilliance. My daughter and I have think-tank sessions which are super fun and serves as a great bonding tool. When you identify your child’s goal or dream, encourage them. At a very early age, my daughter developed self-doubt, which can be triggered by previous failures or low self-esteem. I quickly began to alter her thought process. Speak life into your children and think about what they like to do. Remind them that all things are achievable and that they can do anything they imagine. I constantly tell my daughter; every invention exists from a thought. My daughter pleaded with me to start her own YouTube channel. I was a little hesitant at first, but I realized that the pros outweighed the cons. Taking a step back, this was the perfect teaching moment. The activities that take place while producing YouTube content have cultivated her interests and talents. Content requires research and the footage requires editing. All that to say, when you “take action” in executing their desires, it will strengthen your child’s esteem. Assisting in executing will help empower them to make changes in their life so they’re able to follow their dreams. I share my dreams and ideas with my daughter daily and I truly value her opinion. Our children our little sponges, soaking up everything they see. When your children witness you accomplishing your dreams and goals, they’ll learn to dream too! Remember, never push them to do what you want; it’s about encouraging them to find their own gifts and strengths. Help them gain confidence to try new things and support their journey. JESSICA TAYLOR (Mother, Philanthropist and Entrepreneur) has over 10 years of experience in marketing, promotions, professional business development, public relations and social media consulting. She is the founder of Red Cafe' Consulting (www.redcafeconsulting.com) and the PATH Foundation, which is committed to serving the community, with integrity and respect while using creative solutions to positively transform lives. Over the past four years TAYLOR has also been honored as a rising leader in her community.